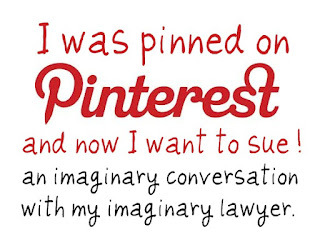 Alternate titles: In Defense of Pinterest OR What in the world are you thinking? If you've opened up your laptop sometime in the last 6 months, you've probably heard of Pinterest. 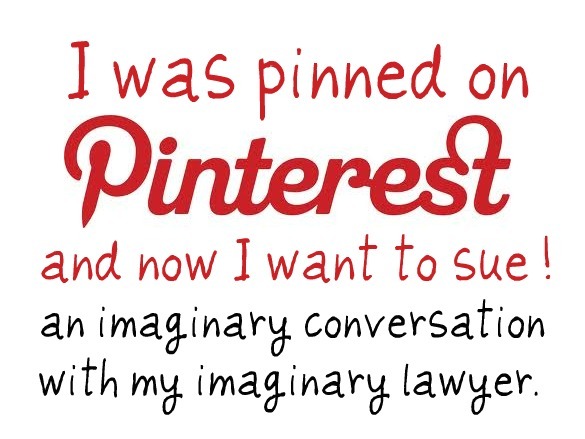 And if you've opened up your laptop more than once in the last 6 months, you've probably heard of the legal questions that surround Pinterest, as discussed HERE and HERE. Now, I'm not a lawyer, nor do I play one on TV. But before having kids I watched a lot of Law & Order. And since having kids I catch the occasional episode of The Good Wife. Which I would totally watch more of if they would post the episodes online. Now that we have established that I have absolutely zero legal expertise, and nothing I say here should qualify as advice in any way, I'd like to share with you the imaginary conversation I had with an imaginary lawyer recently. Me: I want to sue this gal who pinned my image on Pinterest! Me: Um... no... she didn't say anything bad about me. In fact, she said she loved my work. But she posted my copyrighted image without proper consent! Mr. Sharq: (still outraged) She infringed your copyright, distributing your content on the internet without your consent, which has cost you thousands of dollars! Mr. Sharq: (learning to be more cautious with his outrage) But she has stolen your ability to make an income from the image, yes? Me: Not exactly. Actually, she's sent thousands of pageviews my way. Which has actually made me money. Mr. Sharq: (grasping at straws) I'm sure she has some significant assets we can go after? A summer home in Belize? Me: Well, come on! This gal posted my image without asking! I want my day in court!! Me: Okay, so it sounds like the Pinterest suit is a no-go. Any chance we can make CBS post episodes of The Good Wife online?? Dubya: It might be a better use of your time to have your husband teach you how to use the DirectTV remote. And that is why if you pin my images, you don't have to worry that I'll be sending a process server your way. And sooooo . . . don't be surprised when The Good Wife has an episode just like you detailed above.